Police say they need the help of people living in local communities to solve crimes in the Las Vegas valley. Sunday night, Las Vegas police were asking the public for someone to come forward with information that could get a criminal off the streets. 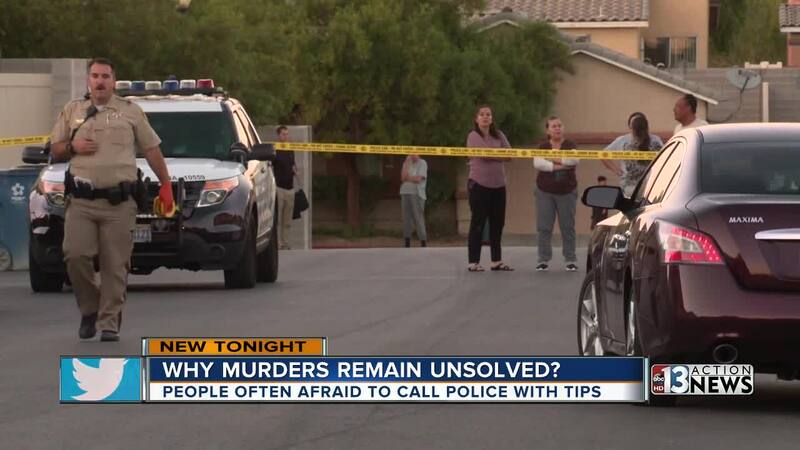 The most recent unsolved case, a shooting near Lake Mead and MLK Sunday afternoon. Police say a 20-year-old man was killed when he was walking down Lake Mead with his girlfriend, when a man came running up behind them and opened fire. Police say many witnesses were around but would not cooperate with their officers to identify that man. “This is what violence does to a community, it tears it apart,” says 13 Action News Crime and Safety Expert retired Lt. Randy Sutton. Sutton once patrolled the very area where the fatal shooting took place Sunday. He says the fears of speaking out are a major problem not just locally, but everywhere when it comes to solving major crimes. But, the fears of talking with police aren’t unjustified. Sutton says fears of being shunned by family friends and ever their entire community plays a role in why crimes can go unsolved. He adds the biggest fear is retaliation. Three suspects involved are still out there. You can anonymously report any crimes or give tips that could lead to an arrest by calling Nevada CrimeStoppers. Their number is 702-385-5555.